This year the University of Delaware celebrates 275 years since its beginnings in 1743, when Presbyterian minister Francis Alison opened up his "Free School" in his home in New London, Pennysylvania. What began as a small school offering classes in the local community now boasts more than 22,000 students. 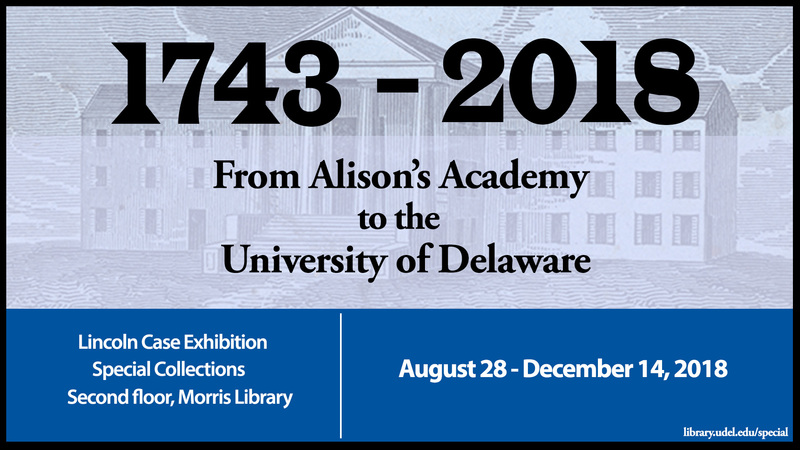 Featuring historical records, manuscripts, and art from the institution's first century drawn from the University of Delaware Archives and Records Management as well as Special Collections and Museums, this exhibition commemorates the founding of our institution. The Lincoln Exhibit Case is next to the Special Collections Gallery and can be viewed during the Library open hours.